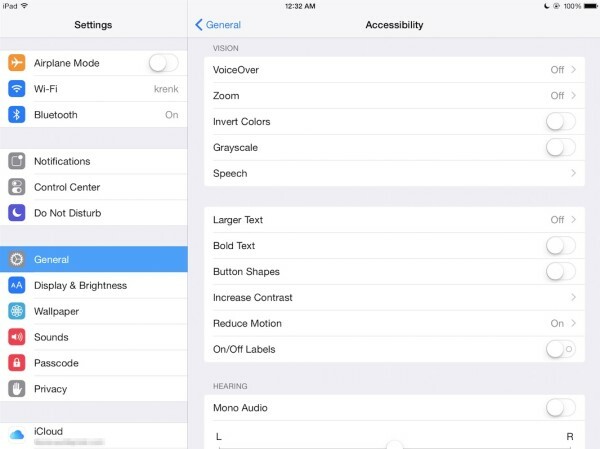 Accessibility features on iOS are available to any user from the moment you buy your iPad or iPhone. Simply turn on your device and there are built in gestures that are immediately available to you. These can be invoked by either (triple) clicking the home button (to turn on VoiceOver) or via simple swipe gestures (double-tap the screen with three fingers to turn zoom off and on). You can manage a variety of accessibility features on your iPad. To get started and see which features met you needs and are accessible to you, open the Settings App–> General–> Accessibility. Here you will find numerous options separated out by feature set. The Magazine has become one of my favorite regular reads on the iPad. I’ve read a number of great pieces on a wide range of topics in it over recent months. This week one particular article in Issue 9 drew me in and ended up being great read and a great feel-good piece as well. The article is titled Re-Enabled – iOS’s impact on those with impairments isn’t just a marketing slide; it’s profound, and was written by Steven Aquino. That scenario plays out for me every day. I work with special-needs children, and I also have a severe visual impairment. The whole piece is a superb and inspiring read. You can see it in Issue 9 (January 31) of The Magazine, or online here: http://the-magazine.org/9/re-enabled.